The Rebelles pilots are the masters of the improvisation. The venerable Z-95 Headhunter, the class-leading Lancer tracking apparatus, and the rugged VCX-100 cargo ship clash the ranks in fierce battles. With the improved E-wing fighter, all these ships bring an excellent versatility to the Rebel forces, their pilots thus offering a hope of freedom to the beleaguered galaxy! 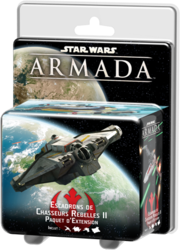 This package includes everything you need to add eight squadrons of fighters - including four elite pilots - to your games.